A double chin can cause an older, heavier look as well as detract from an otherwise balanced facial appearance. Fortunately, now there is Belkyra, a minimally invasive procedure that permanently dissolves fat cells beneath and around the chin to combat a double chin. Belkyra (deoxycholic acid) is the first and only Health Canada approved injectable drug that contours and improves the appearance of a double chin due to submental fat. Belkyra is deoxycholic acid, which is a naturally occurring molecule in the body that helps to break down and absorb dietary fat. 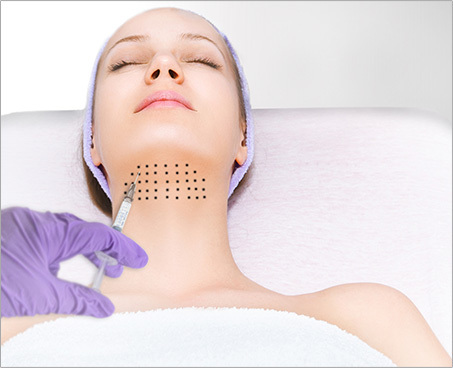 The injectable liquid disrupts the fat cells that cause the double chin.. These cells are then absorbed by the body, leaving your submental area noticeably slimmer, with a much improved contour. A Belkyra treatment, takes about 20 minutes in office. Most patients will need two to four treatments, and these treatments are usually spaced about a month apart. As far as downtime, you might notice mild to moderate swelling at the injection sites, but your “downtime” from Belkyra should be very minimal.